High quality serviced offices for 1 to 250 people. 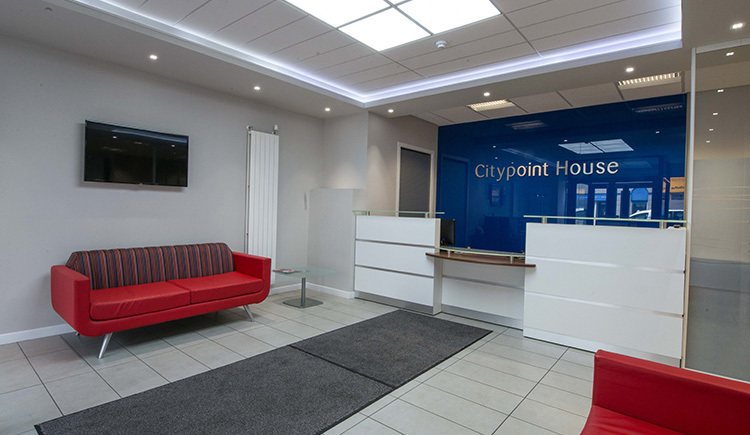 Located in the West End of the city centre, close to excellent transport links and public car parking, Citypoint offers modern space over 3 floors. Citypoint benefits from key business areas such as Union Street, Carden Place and Queens Road within the surrounding area. We offer serviced office accommodation on flexible short and long term leases, along with meeting room hire and hot desking spaces in Westhill and Aberdeen. We also offer a range of virtual office facilities. For further information or to enquire about availability, contact us now. Let’s work together to make your business grow..
At BlueSky we pride ourselves in being flexible to your business needs. Take a look around examples of the 1-4 desk space offices currently available. At BlueSky we pride ourselves in being flexible to your business needs. Take a look around examples of the 5-12 desk space offices currently available. At BlueSky we pride ourselves in being flexible to your business needs. Take a look around examples of the 12+ desk space offices currently available.